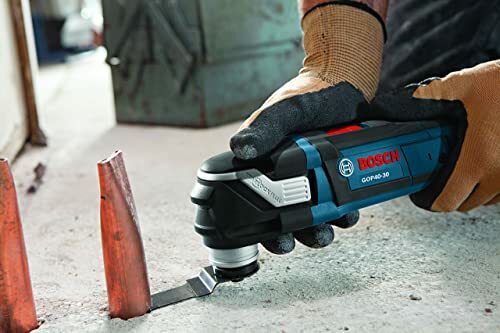 If you are looking for a fast and powerful multi-tool that will last very long and not let you down when you need it most, the Bosch GOP40-30C make a great choice. Let me explain why this tool is perfect for every avid DIYer and professional builders. I give it up to Bosch on this one. At first, I wasn’t sure if this tool would challenge my older tool. But the moment I got the GOP40-30C out of the box, I knew it is going to send my older multi-tool to the island of unsuitability. The Bosch GOP40-30C beats the pants off the tool by a long shot. The heavy-duty 4.0 amp motor along with the 3.0ᵒ oscillating arc provides plenty of power to get any cutting, sanding or scrapping done with ease. During my last routine home improvement exercise, I found the tool very efficient at making different types of cuttings without wasting time. The 1-1/4 inch all-purpose bi-metal blade worked perfectly in making plunge cutting in solid wood, as well as cutting nails and other non-ferrous metals within a very short period of time. The tool also fared well on different flush cutting and sanding operations, making it an ideal tool for serious crafters. The Bosch multi tool comes with 32 accessories to carry out different operations like grout removal and many other tasks with ease. It also has a gentle, soft start feature to start and handle difficult cut without any trouble. This feature helps me to begin my operation at a slow speed thus allowing me to maintain control, especially when working at awkward angle/position. This feature is one of the best parts of this product. With this feature, you can snap in the blade or the attachment you want to use without using any tool. You can also detach the blade by using the release lever. And since you can remove or snap in an accessory with the speed light, it saves a massive amount of time when you need to change your accessory frequently. You can now say goodbye to burnt fingers, and when I say no more burnt fingers, contractors and DIYers will understand. The Bosch GOP40-30C has a 13-foot power cord which is one of the longest I’ve seen on a multi-tool. This feature provides lots of maneuverability to handle your projects with ease. The tool also has a variable speed dial that allows you to tailor the tool’s speed according to your application. Bosch did not stop there. They included two cool features in the tool. On the back, you will notice the swivel that helps to protect the cord and maneuver the tool easily. While on the front, the cord has a no-mar pad that helps to protect delicate work. 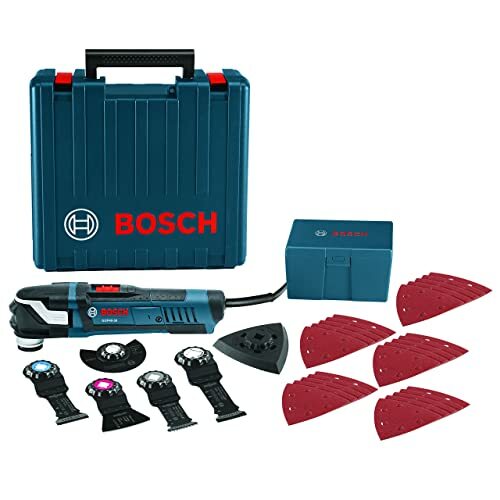 Bosch recognizes the frustration that goes along with working in the dark and includes LED light on this model to provide extra illumination when you need it most. The unit is also compatible with Starlock and Starlock Plus accessories for more accessory options and high torque transfer. I also liked the way this oscillating tool handles in my hand; it feels solid during operation. Lastly, the tool includes a storage bag to house the tool and its attachments. It also comes with 30 days money back, a year of service protection plan and a year warranty. Just like the tool, the blades are expensive and more expensive than the OIS and are unavailable in some parts of the states. Hold the tool carefully during operation, avoid dropping it accidentally on the floor to prevent damages. If you plan to use the tool or the blades frequently, it is more economical to buy them in bulk. Use the right accessory for the right operation. If you have troubles in identifying the right tool for your project, Bosch’s color coding will help you find the blade you need for the job. See the picture below. If you are in the market for a multi-purpose oscillating tool, you need to consider the Bosch GOP40-30C StarlockPlus Oscillating Multi-Tool. This tool and its accessories are exactly what you would expect from a heavy-duty or professional oscillating tool. This Bosch oscillating tool is not only reliable; it offers a variety of solutions to tackle your jobs quickly and efficiently. So, make your order today and start getting stuff done with ease.